Have you noticed a unicorn or two around lately? The unicorn craze is still going strong and it’s no wonder that unicorns have become so beloved. Unicorns are beautiful, majestic creatures with just the right amount of mystery and elusiveness, and they symbolize the spirit of individuality. So it’s no surprise that so many people, adults and children alike, are clamoring for unicorn-theme parties. If you’re planning a graduation party or a summer birthday party for your unicorn fan, you’ve probably searched the internet for some ideas. Every unicorn party will likely have a unicorn head cake. By the way, does anyone know who the original designer of that cake is? Just wondering. A unicorn party also needs some unicorn treats. Look no further! 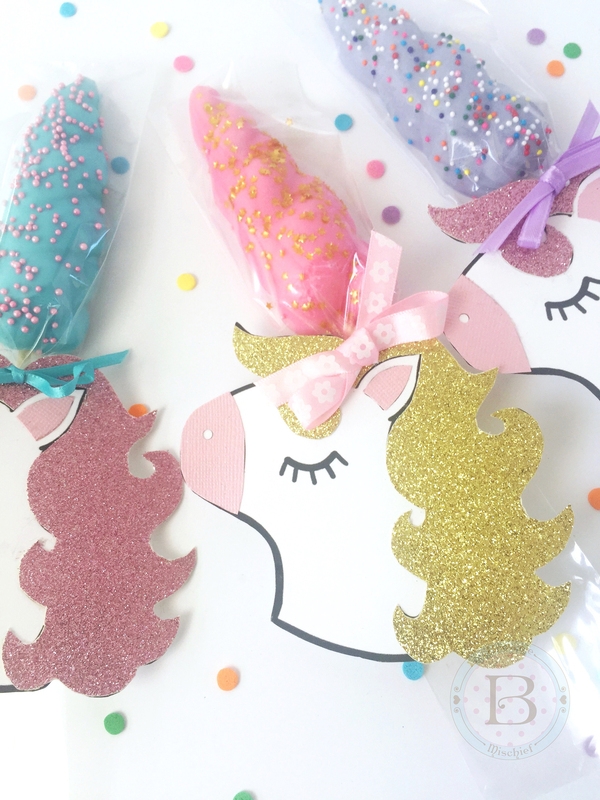 These Unicorn Horn Cookies make perfect party favors. They’re fun to make and don’t require any special skills. You can also make them ahead which means they’re stress-free! I came up with Unicorn Horn Cookies when making a Unicorn Rainbow Milkshake. I had extra cookies left, so I decided to take them up a notch by dunking them in candy melts and adding sprinkles. They looked so festive, that they instantly became official party favors. I designed some unicorn gift tags to go with them and I’ve created a free printable to share with you! Click here for free unicorn gift tag printable. You can find the cookie recipe at the bottom of the Unicorn Rainbow Milkshake post. 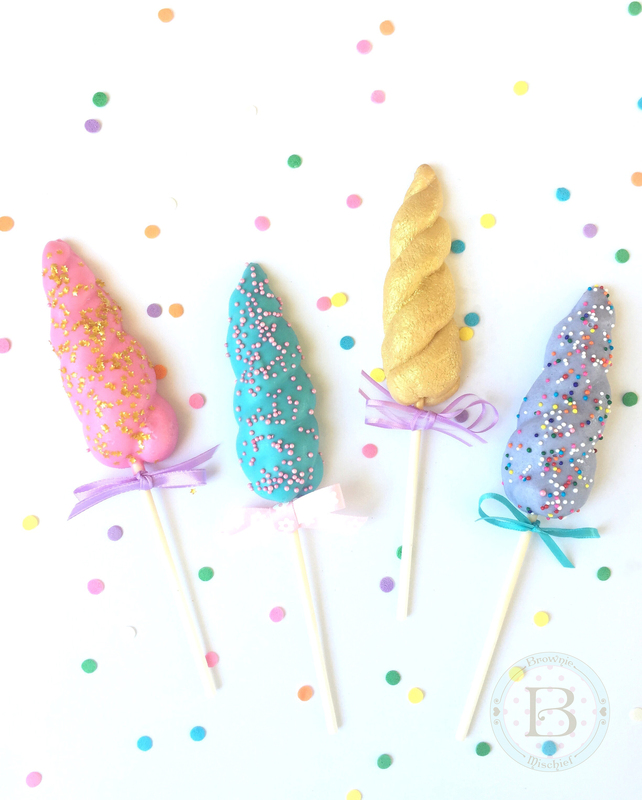 Click here to find the Unicorn Horn Cookies recipe. Unicorn Horn Cookies Click here to find the recipe. 6-inch lollipop sticks Click here to find lollipop sticks. 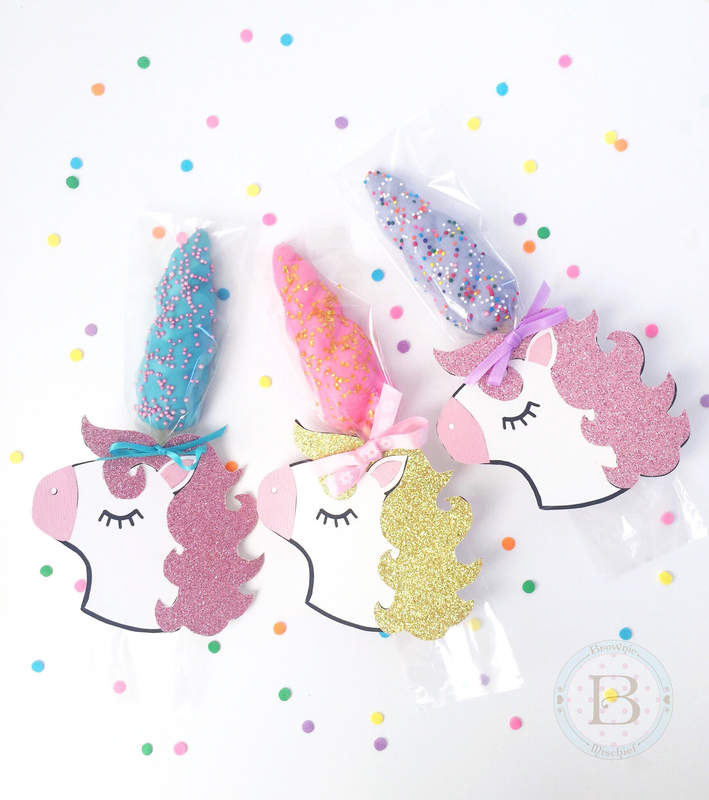 sprinkles, nonpareils or edible glitter Click here to find edible glitter. hole punch Click here to find 1/8″ hole punch. pretzel treat bags (optional) Click here to find pretzel treat bags. Bake unicorn cookies and cool completely. Place candy melts in a microwaveable container and heat in a microwave at 50% power for 1 minute. Stir and heat for 20 second intervals until melted. If the melted candy is too thick, add melted vegetable shortening a half teaspoon at a time until desired consistency is reached. Dip cookies into melted candy and tap off excess. Place cookies on a tray lined with wax paper. Decorate with sprinkles before the candy sets. Place cookies in refrigerator for a few minutes, until set. Print unicorn gift tags on card stock. Click here for free unicorn gift tag printable. 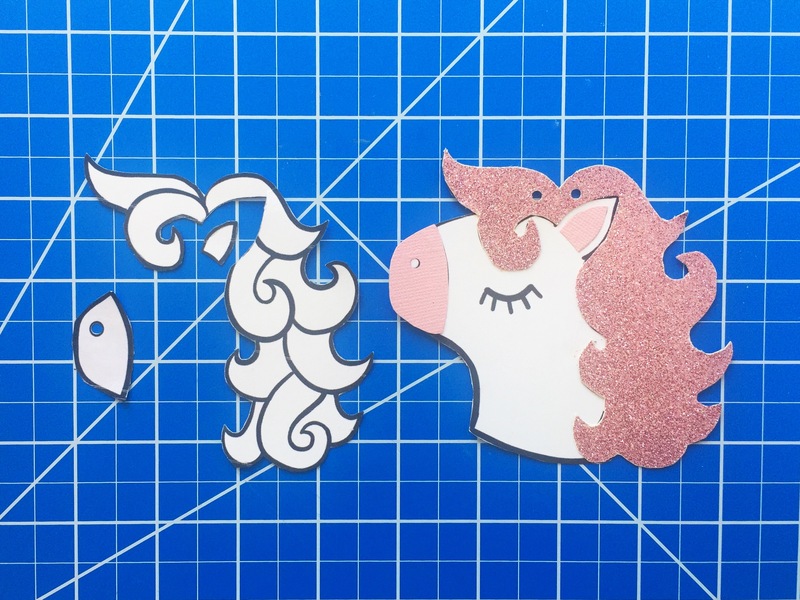 Cut out desired number of unicorn gift tags. Cut out one extra to use as a pattern. Cut mane, muzzle and ear out of scrapbook paper. Affix with craft glue. (Alternately, you can omit the scrapbook paper step and simply print out the unicorn gift tags and color them with colored pencils or markers.) Punch two holes, about 1/2-inch apart near the top of each gift tag. Place cookies in treat bags, if using. Tie ribbon onto the lollipop sticks at the base of the cookies. Thread ribbon through the holes of the gift tags and tie into bows.